A recent study has unveiled an interesting information about bats. Bats are upgrading and adapting their hunting techniques according to the noise of the cities they dwell in. It has been found that bats usually rely on supersonic sounds to find their food. But in noisy environment bats can switch their sensory systems and activate echoholation. This strategy owned by bats is extremely important and ignites a new question as how other such animals are adapting themselves? A research report published in 2010, showed that bats take longer time to find prey than usual while on highways. The reason is the traffic signals on highways are distraction to them. Hence, they find it difficult to hear the rustling sound made by spiders, bugs and other insects. Brock Fenton, Western University said that not every animal can get accustomed to noise and upgrade their system. Fortunately bats can. Previously, research has shown that human-made noise is linked to higher mortality rates for certain animals and that it disrupts communication among others. “It’s having a big effect on animals and plants,” Fenton says. The researchers did an experiment with 12 bats. they exposed the bats to two 2 robotic frogs. One frog only released the mating sounds while the other inflated a a balloon producing the the movement of a vocal sac. It was found that when additional noise was added in the background, the bats chose the balloons 75% of the time. This is because the bats refused to rely only on sound and chose both sound and echolocation. The movement of the artificial vocal sac made it easier for the frogs to detect the frogs. This experiment shows new dimensions to urban wildlife. Check out the abstract of the paper. nthropogenic noise can interfere with environmental information processing and thereby reduce survival and reproduction. Receivers of signals and cues in particular depend on perceptual strategies to adjust to noisy conditions. We found that predators that hunt using prey sounds can reduce the negative impact of noise by making use of prey cues conveyed through additional sensory systems. 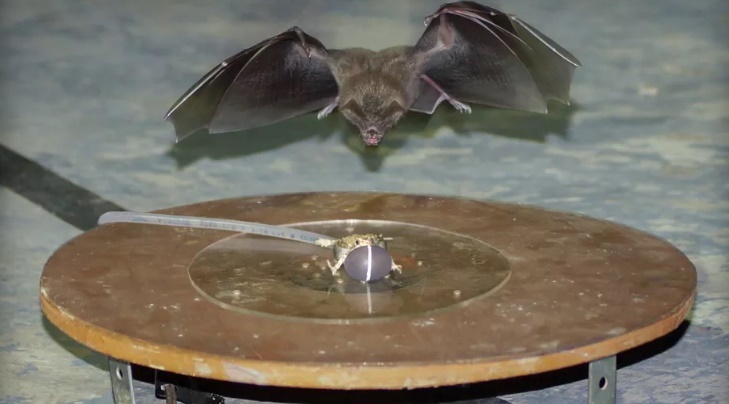 In the presence of masking noise, but not in its absence, frog-eating bats preferred and were faster in attacking a robotic frog emitting multiple sensory cues. The behavioral changes induced by masking noise were accompanied by an increase in active localization through echolocation. Our findings help to reveal how animals can adapt to anthropogenic noise and have implications for the role of sensory ecology in driving species interactions.